Our flight out to Salt Lake City was mostly uneventful, and security didn’t bother us too much considering we were a bunch of twenty-somethings with hardly any (but certainly odd) luggage and one way tickets. Salt Lake City is a very striking city from the air, built quite literally at the base of a mountain range, it makes any view from within the city spectacular. We got our rental car outside the airport – the tiniest little Toyota something that handled like a golf cart. Considering the vehicle we were on our way to rescue, it seemed pretty funny. The drive to Wells from Salt Lake is flat and straight. 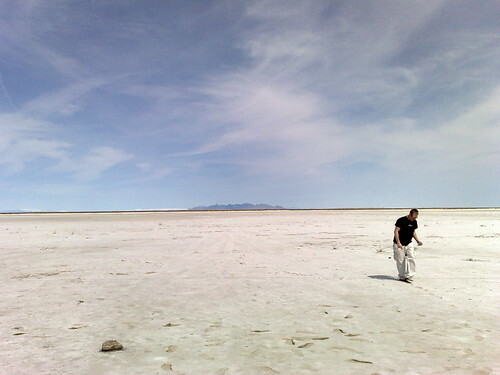 Much of it runs through the Salt Flats…which are pretty much exactly what they sound like. Along the way you can see a few salt refining plants, with massive mountains of salt outside. All along the highway, people wrote messages with rocks that stood out clear as day against the salt backdrop. We felt compelled to pull over, taste, and write some messages of our own. We arrived in Wells in no time at all, thanks to low traffic and a high speed limit. Wells appeared almost exactly as we left it, and I have to admit it felt comfortable coming back there. I’d spent a lot of time walking around the town and talking to people before we left, and I felt like I got to know the place. And there was the bus! Straight ahead of the off ramp! The bus was in a dirt lot behind the Shine ‘n Chrome truck wash, and our little economy car just barely had enough clearance to jump the curb. She looked good, clean, untouched. Ali climbed in through the back and … hmm … some stuff was missing. We’re not really sure how, as there were no broken or open windows, but someone managed to get into the bus and take some stuff. The few items of any value were gone (the toolbox, inverter and batteries, radio and guitar) but they left some fairly easy to take items too. There didn’t seem to be much sense to what they took – among the items missing were a Yoshi doll still in its packaging, our moleskine of signatures, the stove (cheap and broken), the body fluid clean up kit that came with the bus, and the speakers we salvaged from an 80s conversion van. Weird. Whatever. What made the bus a bus was still completely intact, and seemed fine. With some borrowed tools from Enoch (the owner of the Shine ‘n Chrome) Mark was able to get the old pump out and the new pump in place with relative ease. I hopped under the bus and reattached the universal joint on the drive shaft. We got a pair of new starting batteries (truth be told, the ones left in the bus were our biggest concern of the rescue, since they were really crappy and may not have gotten her started, so not much of a loss there), and started cranking to purge the new pump. Once purged, we tightened the lines, and tried to start. We could hear the engine nearly start, and then our batteries gave out. Not surprising, that was a lot of work. We got on the phone with AAA to see if we could get a jump. While we were still on hold, Enoch brought his truck and jumper cables over, and got us started. The bus was running again, and smoking up a storm, so we said our thank yous and goodbyes, and headed back to Salt Lake City to return the car and begin our trip home. On the first hill outside Wells, a strange noise started coming from under the bus, and suddenly it got MUCH louder. Time to pull over and investigate. The universal joint caps I had attached had flown off, leaving the drive shaft barely attached. It turns out there was a little tooth I was supposed to set the caps under, and I had them on top of it, so they didn’t stay very long. Luckily, we had another two caps, but no socket with which to secure them. On the phone with AAA again, asking for someone to come by with just that socket, since we would make the repair ourselves. Apparently, AAA can’t do that, so Enoch to the rescue! He was able to drive the mile or so up the road to meet us and he brought the socket we had used earlier. Moral of the story: good people are better than AAA any day. We returned the car at the SLC airport, which is always entertaining. I don’t think that driving that bus into an airport will ever get old. The looks we get are even better than what we see on the highway. With the rental squared away, we headed into the mountains to find a place to stay for the night. Tagged Salt Lake City, Wells, What Roses?